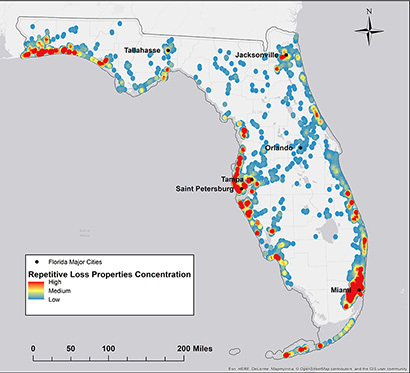 "This study identified properties and surrounding land in Florida where buyouts can reduce future flood risk to socially vulnerable communities and simultaneously promote the restoration of the floodplain to a more natural condition," said lead author Juliano Calil. "We identified almost 150 properties in Miami-Dade County alone that are located in areas where these objectives are very well aligned." As a graduate student in ocean sciences at UC Santa Cruz, Calil developed methods for assessing coastal risks and identifying coastal areas with potential for remediation projects that can meet multiple objectives. He applied these methods to the California coast in a similar study published in 2015, also in collaboration with the Nature Conservancy. Calil earned his Ph.D. in 2017 and is currently a senior fellow at the Center for the Blue Economy, Middlebury Institute of International Studies, in Monterey. Flood events cause disproportionate impacts on more vulnerable groups, such as the poor, minorities, the elderly, and the disabled, which tend to live in high-risk areas and lack basic resources to prepare for floods and other natural disasters. Incorporating social vulnerability into their analysis was a significant improvement over the 2015 study, Calil noted. Coauthor Sarah Newkirk, senior coastal project director with the Nature Conservancy in California, said, "Our approach identifies an opportunity to use funding previously designated only for flood mitigation to achieve additional benefits, including valuable social and ecological outcomes." Flooding is the most common and damaging of all natural disasters in the United States. According to the Federal Emergency Management Agency (FEMA), 44 of the 46 major disaster declarations in 2016 were related to storms, with flooding being a significant factor in almost 70 percent of them (30 events). In 2016, severe floods in the U.S. resulted in more than $17 billion in damages (six times higher than in 2015). Twelve individual weather and climate events caused more than $1 billion in damages each, and at least five severe 1,000-year precipitation events occurred in the United States in 2016. The new study proposes that government-funded buyouts, followed by structure demolition or relocation and the restoration of floodplain habitats, can support social, environmental, and economic objectives simultaneously. "It is important to note that buyouts must be done from willing and volunteer sellers, and relocation projects must be executed in a thoughtful and fair manner," Calil said.